This is a treasure-trove of a book written by a generous, humorous, wise and voluptuous author, the sharing of whose life experiences in a highly competitive field is deeply and unusually enriching. Rick Gekoski is the rare kind of observer whose qualities are comparable to that of the much-missed broadcaster Alistair Cooke. American by birth and earlier education, Gekoski took a D.Phil at Oxford and practised as an academic at the University of Warwick where his teaching is as vividly and happily remembered by students as his powerfully encouraging personality. He left academia to set up in London as a rare-book dealer and his latest work is the account of adventures as an expatriate connoisseur not only of unusual books, letters and literary trouvailles but also of their concomitant human stories. He records his understandably equivocal admiration for Brian Coffey, the old friend of Beckett who, when quizzed on the number of letters he had received from his fellow-Irishman newly-arrived and recently-published in Paris, replied: Never counted. Thousands, probably. Coffey had thrown them all away because of, rather than despite, Sam’s growing fame. Explaining to the dealer, he said, ‘They were private…They were just between us. A similarly fine sensibility is manifested in Gekoski’s mission statement, presented as the chapter on a forger whose activities eventually included murder. It is that: The hunt must go on [for] buried, unlocated, misunderstood, misrepresented objects of every kind which are of value both commercial and cultural. In Gekoski’s assiduous though never slavishly-conducted search for and reflections upon such objects, he raises fundamental questions about the value of art in both Western and other societies. 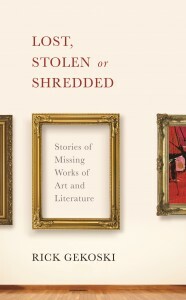 Today, art theft is the world’s third largest criminal industry, exceeded in total value only by arms and drug dealing. Although Gekoski raises philosophical questions on provenance and authenticity, the gravity of his enquiries are always balanced by the wit and elegance of his prose. Observations range widely. The chapter on The Oath of a Freeman highlights first the constraining literalness of the claim, made by the founding fathers of America, that all men are created equal and second, the importance in what was written amongst the savages and the turkeys, of what is missing, that’s to say a) brown men and b) all women. After the theft in 1911 from the Louvre of the Mona Lisa, throngs at the railway stations punctuating each stage of the icon’s return to her adoptive home are likened to the crowds accompanying Princess Diana’s body on its journey to the island at Althorp. Women chained to uncongenial destinies often choose odd bedfellows to make their escape. A chapter entitled ‘Lost to the World: The Library of Guido Adler’ contains as frontispiece a photograph, terrifying in its banality, showing a Nazi officer supervising the loading of seized Jewish property onto a cattle truck. The writer W.G. Sebald identified in Austerlitz the huge depot in which it was probably earlier stored. Ironically, it is the site of the modern Bibliothèque Nationale de France, a hideous ziggurat of a library designed as a monument to Mitterand, which reflects a similar moral and architectural ugliness. A moving afterword reflects on the nature of loss itself. Quoting Amin Maalouf it reads: Let us thank God for having made us this gift of death, so that life is to have meaning; silence, that speech is to have meaning; illness, that health is to have meaning; war, that peace is to have meaning. Let us give thanks to Him for having given us weariness and pain, so that rest and joy are to have meaning. That is, let us celebrate loss, so that presence is to have meaning. Lost, Stolen or Shredded is an Aladdin’s cave of wonders: fifteen chapters on a wide variety of separate subjects linked by their author’s humanity and generosity of spirit which illuminate every page.